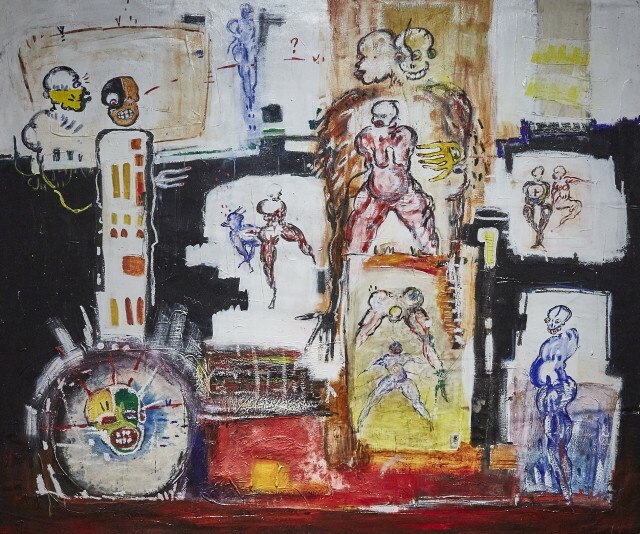 Dominique Zinkpè was born in 1969 in Cotonou, and is one of the most recognisable contemporary artists to emerge from Benin. His work is influenced by the country's rich history and his immediate African surroundings. Zinkpè's paintings have a surrealist quality - loose figures battle and swim on the canvas. Nurturing fertile women often appear in Zinkpè's work recalling themes of desire and motherhood. He uses a mixture of oil, acrylics and found objects on his canvas and leaves large areas of empty space. Zinkpè's paintings can be jarring and unsettling, informed by animism, religion and his own internal struggles. Zinkpè's sculptures are no less arresting. Many of them consist of assemblages of carved wooded Ibeji dolls that engage the Yoruba concept of twinship. Dominique Zinkpè was awarded the Prix Jeune Talent Africa in 1993 and won the Prix Umeoa at the 2002 Dakar Biennale.